Happy 2014! Our January calendar is available below. Find your name and drink for free all night. Merry Christmas from The Front Porch! All of your favorite bartenders and management at The Front Porch would like to wish all our family & friends a very Merry Christmas! 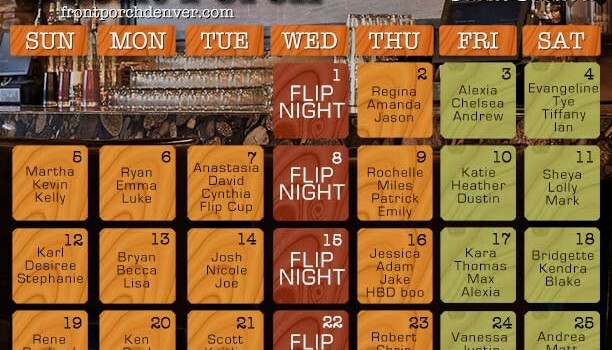 As our Christmas gift to you, we will be OPEN tonight for Flip Night! It’s the gift that keeps on giving. See you tonight! See a Christmas show in Denver, followed by drinks at Front Porch – perfect night out!